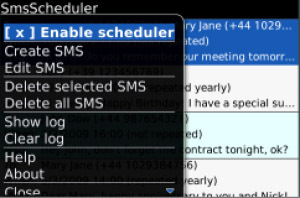 With SmsScheduler you can prepare your SMS messages in advance, and schedule them for automatic delivery at any date & time in the future. Various types of recurrence are also supported, so that a Happy Birthday message is sent all years on Feb 12, for example. Download free HD wallpaper for your Blackberry, iOs, and android. 2012 All Rights Reserved Blackberry Zone.